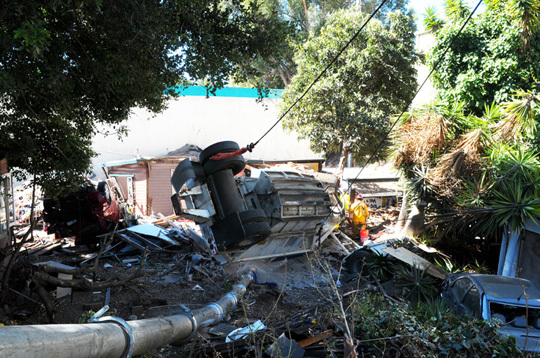 Eight-year-old Jaciel died Tuesday morning, along with his parents — Leon Leonel, 23, and Lorena Guadalupe-Tellez Pacheco, whose age was unknown — when a big-rig truck plowed into their house at 4119 State St., near the Hope Ranch Inn in Santa Barbara. The truck’s driver lost control of the brakes while traveling down Highway 154 from San Marcos Pass. The big rig was hauling several tons of gravel bound for Santa Paula. 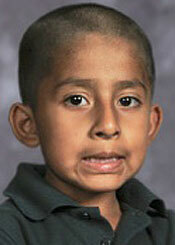 “Jaciel was one of those great little boys,” she said. Standing in front of the school marquis that read “Jaciel, rest in peace, we miss you,” Killgore shared how the students were taking the news of the loss of their classmate. Counselors spent the morning going to each classroom to help explain the news to the students, and counseling for the staff was available after classes ended Wednesday. Santa Barbara County Alcohol, Drug, and Mental Health Services medical director Edwin Feliciano said the organization is working to help with counseling in the school. The Leon and Tellez Families Memorial Fund has been established at Wells Fargo Bank, La Cumbre Plaza Branch at 3804 State St., Santa Barbara, 93105, 805.687.5582. Donations can be made to account No. 3395038585. News of the accident stunned the South Coast community Tuesday morning. The driver, identified as Joaquin Garcia Morales, 51, of Oxnard, suffered minor injuries in the crash, which occurred just before 7 a.m. Morales, the owner and operator of the truck, was hauling gravel in two trailers leased from a Santa Ynez Valley rock quarry. According to California Highway Patrol officials, Morales said he experienced problems with his braking system as he left the quarry. He brought the tractor-trailer to a stop before entering Highway 154 and believed he had fixed the braking problem. After passing over San Marcos Pass, authorities said Morales again experienced problems with the brake system. Unable to regain control of the brakes, he attempted to stop the tractor-trailer by downshifting and using the hand brake. Several witnesses saw billowing smoke coming from the truck’s wheels as the vehicle went through the Calle Real and State Street intersections, traveling about 45 mph. Morales’ truck then veered into the parking lot area of the Hope Ranch Inn but was unable to stop as it crashed into three cars parked in front of the single-story cottage residence, killing Tellez and his parents. But new details are emerging about the driver’s history. Morales’ driving records reveal a litany of citations, according to Ventura County Superior Court records. The documents reveal that Morales has received 17 citations since 2001, ranging from inadequate tires for highway driving to unsafe speeding for prevailing conditions. In fact, six of the citations are speed-related and two cited Morales for the condition of his truck’s brakes. He paid $2,955 in fines for the citations during that time. That history is likely to play a part as the CHP continues to investigate the crash. In the meantime, there have been murmurings about whether Highway 154 should even be open to commercial trucks. On the route Morales traveled, commercial trucks make up only about 3 percent of the route’s total traffic. According to numbers from Caltrans, 448 two-axle trucks made their way across the highway in 2008, followed by 39 three-axle trucks, 16 four axles and 35 with five or more axles. Caltrans spokesman Colin Jones said that amount of traffic is probably below average compared with statewide figures. He said he wasn’t aware of any formal requests to ban trucks from that portion of the highway, although that’s a process that has taken place at routes around California, usually prompted by a safety incident. “But there are steep grades all across California,” said Jones, adding that it was “premature” to say what would happen to traffic patterns as a result of Tuesday’s crash. Jones said he wasn’t aware of a higher concentration of truck-related incidents on that stretch of road. Third District Supervisor Doreen Farr said the issue of trucks on Highway 154 are a concern to her and her constituents, from the size of trucks to the materials they carry. Farr drives the 32-mile San Marcos Pass Road often, as her district stretches from the Santa Ynez Valley to Goleta and Isla Vista, and has raised concerns with the CHP offices in Buellton and Goleta, as well as during Santa Barbara County Association of Governments meetings, she said. Farr and Second District Supervisor Janet Wolf, chairwoman of the Board of Supervisors, plan to organize a briefing from the CHP and Caltrans to better understand the highway’s requirements regarding brake checks, vehicle limitations, hazardous material and hazardous waste transportation. Farr said she also plans to put the issue on the supervisors’ agenda, although any changes to road rules would necessitate support from state agencies. “It’s just terrible that it happened, especially since the issue has been raised,” she said. On Aug. 10, the supervisors voted unanimously to ban tractor-trailer rigs longer than 30 feet from Harris Grade Road because of concerns about collisions and trucks getting stuck attempting to turn in the narrow areas. Farr said that, like Harris Grade Road, truckers may be drawn to Highway 154 because of increased GPS use, which may show an earlier destination time than taking Highway 101. A support group for anyone in the community affected by the tragedy will be held at Franklin Community Center, 1111 E. Montecito St., at 6 p.m. Friday. Click here for a Noozhawk slide show. Noozhawk staff writer Lara Cooper can be reached at lcooper@noozhawk.com. Noozhawk staff writer Giana Magnoli contributed to this report.